At the beginning of the nineteenth century in Britain, religion and the sciences were generally thought to be in harmony. The study of God’s word in the Bible, and of his works in nature, were considered to be part of the same truth. One version of this harmony was presented in William Paley’s Natural theology, or evidences of the existence and attributes of the deity (1802). There is precisely the same proof that the eye was made for vision as there is that the telescope was made for assisting it … they are made upon the same principles, both being adjusted to the laws by which the transmission and refraction of rays of light are regulated … what could a mathematician instrument maker have done more, to show his knowledge of this principle? Another important example of this kind of natural theology was a series of scientific books known as theBridgewater treatises. These were financed by Francis Henry Egerton, the eighth earl of Bridgewater, whose last will and testament provided eight thousand pounds for the publication of works ‘On the Power, Wisdom, and Goodness of God, as manifested in the Creation’. Eight volumes were produced between 1833 and 1840 by leading authorities in moral philosophy, natural history, astronomy, physiology, chemistry, and geology. The books were widely discussed, and extracts often appeared in sermons. A sense of what these books were like can be gained by looking at one example, the treatise on geology. It was written by William Buckland, the professor of geology at Oxford. It contained chapters entitled, ‘Proofs of design in the structure of fossil vertebrates’, ‘Proofs of design in the structure of fossil vegetables’, ‘Proofs of design in the effect of disturbing forces on the strata of the earth’, and so forth. In one chapter, Buckland discussed an extinct mammal, Megatherium or the giant sloth. The animal had been reconstructed from fossilised remains in the early nineteenth century. Because of its massive size, and its apparently awkward proportions, some experts thought it must have been doomed to an unhappy life and a speedy decline. How could an intelligent and beneficent God have designed such an animal? Buckland remarked that the animal was an ‘apparent monstrosity of external form’. But he argued that its internal organisation and habits, deduced from a knowledge of comparative anatomy and physiology, showed the creature to be perfectly adapted to its place in nature. True, it could not run, leap, or climb. But it had no need for such powers. Its main occupation was digging roots for food, and it could demolish any predator with a single swish of its tail or paw. ‘[Its] entire frame’, Buckland wrote, ‘was an apparatus of colossal mechanism, adapted exactly to the work it had to do … calculated to be the vehicle of life and enjoyment to a gigantic race of quadrupeds … perishable monuments of the consummate skill with which they were constructed’. What appeared at first to be a grossly imperfect creature, turned out, on close examination by an expert zoologist, to show evidence of God’s wisdom and benevolence as a designer. Some key fossils of Megatherium had been supplied by Darwin, who found them on the coast of Chile during the Beagle voyage. The case of Megatherium thus shows how Darwin’s earliest research helped to further the programme of natural theological science. Another form of natural theology can be found in the work of the comparative anatomist Richard Owen. In a series of publications in the 1840s, Owen argued that the animal kingdom was arranged according to four distinct organisational plans or types (fish, birds, reptiles, and mammals). These ‘archetypes’, as Owen called them, were originally conceived in the mind of the Creator, and one of the aims of Owen’s anatomy was to show how each of these divine archetypes was embodied in the structure of particular animals. For Owen, God’s unity of plan was expressed both in the clear morphological divisions that separated animal groups, and in underlying structures that connected these divisions into a single order of creation. Owen developed this theory of underlying structures in another set of works on the vertebrate skull and skeleton. The skull is a province of the whole skeleton, consisting of a series of segments or vertebrae essentially similar to those of which the rest of the skeleton is constituted. General anatomical science reveals the unity which pervades the diversity, and demonstrates the whole skeleton of man to be the harmonized sum of a series of essentially similar segments. Owen went on to extend this theory of the human skeleton to other vertebrate animals. The bony frames of mammals, birds, reptiles, and even fishes, were thus all connected, from head to toe (or claw, or fin), thus showing the unity of plan of God’s creation. Owen’s highly theoretical anatomy was quite different from Buckland’s more empirical programme. Owen’s arguments about the structural unity of nature were also very different from Paley’s arguments, which emphasised highly differentiated structures, adapted for specific purposes. In comparing the work of Paley, Buckland, and Owen, it becomes clear that natural theology was not a single, unified tradition. There were in fact different, and to some degree competing, versions of natural theology. Natural theology was also not without its own controversies. These were especially evident in geology. Discoveries of the fossil remains of extinct creatures, together with other evidence of the age of the earth presented in the work of Charles Lyell and others, challenged the literal reading of the creation story in Genesis. One reading of Genesis, for example, assigned each day of creation to a different geological epoch. Creation was viewed by some as a progressive unfolding, rather than as a single event. Further questions were raised about the role of God in relation to the operation of natural forces and laws. Some natural philosophers and astronomers, such as William Herschel, speculated about the origins of the universe, and posed the ‘nebular hypothesis’, according to which creation was entirely governed by natural laws from the first instant. Such views held that the world was a product of divine plan and will, but they challenged belief in miracles. Other competing versions of natural theology were offered in evangelical circles. The geologist and Calvinist Hugh Miller wrote a book entitled Footprints of the creator (1847), arguing that evidence of the biblical flood and of the decline and degradation of life since Adam’s fall could be found in fossil formations. In places, Miller’s work verged on the scriptural geology favoured by extreme evangelicals who supported a literal reading of Genesis. Finally, natural theology was also controversial within the Church of England. Some Anglicans, like the Oxford theologians John Keble and John Henry Newman, claimed that looking to nature for evidence of God’s existence and attributes was misguided. Belief, they argued, should not be based on reasoned inferences or observations of the senses, since these were always flawed; rather, belief should be based on the authority of the Church and its leaders. Darwin’s work is usually viewed as undermining natural theology by replacing Paley’s model of an ingeniously designed creation with a theory of functional adaptations, acquired through a process of random variation, and then accumulated through natural selection. The old argument from design in nature, as given by Paley, which formerly seemed to me so conclusive, fails, now that the law of natural selection has been discovered. There seems to be no more design in the variability of organic beings and in the action of natural selection, than in the course which the wind blows. The only distinct meaning of the word ‘natural’ is stated, fixed or settled; since what is natural as much requires and presupposes an intelligent agent to render it so, i.e. to effect it continually or at stated times, as what is supernatural or miraculous does to effect it for once. Reactions to Darwin’s work also show that its meaning as regards design in nature was far from straightforward. The correspondence Darwin received in the years following the publication of Origin reveals an extremely wide range of interpretations, from complete condemnation to subtle accommodation, to active support. Darwin’s explanation for species change, natural selection, was often interpreted in religious form, as an instrument of God’s design. I have gradually learnt to see that it is just as noble a conception of Deity, to believe that he created primal forms capable of self development into all forms needful pro tempore & pro loco, as to believe that He required a fresh act of intervention to supply the lacunas which he himself had made. Kingsley was able to incorporate evolutionary theory into a reformed vision of nature as a product of beneficent design. His remarks pleased Darwin so much that he had this sentence inserted in the second edition of Origin. One of Darwin’s most intimate correspondents and leading supporters was the American botanist Asa Gray, a devout Presbyterian. Gray helped to arrange for Origin to be published in America, and wrote a series of reviews in leading journals. One point that Gray argued at some length was that natural selection was not inconsistent with natural theology. Darwin, according to Gray, said only that nature proceeded according to fixed laws; he wrote only of secondary causes, not of first causes. He left questions such as the origin of life, and the design of nature’s laws open, for theologians to answer as they might. Darwin’s response was again enthusiastic. He praised Gray’s reviews, and financed their publication in pamphlet form for distribution in England. The correspondence between Darwin and Gray is especially rich in discussions of design in nature. It is clear from these discussions that there were different versions of natural theology, different positions on the role of God in nature being considered. These were not debates between science and religion, they were debates within natural theology, and within science itself. And they were not new, they had been going on for decades prior to the publication of Origin. Darwin’s work thus did not introduce controversy into natural theology, nor did it sweep natural theology away. But what did happen in the years following Origin , is that the public debates became more polemical, and a polarised view of science and theology was introduced by a few very vocal protagonists. Just such a polemical view of science and religion is presented in reports of the famous exchange between Thomas Huxley and Samuel Wilberforce, bishop of Oxford, at the meeting of the British Association for the Advancement of Science in 1860. Supposedly the spectacle of man of God ‘slain’ by man of science caused women in the audience to faint. Stories of this debate continue to circulate. They rest on a highly selective reading of the accounts written by the major protagonists, especially Huxley himself. Huxley used Darwinism as a platform for a political campaign against the authority of the clergy in education. Occasionally referred to as ‘Pope Huxley’ by friends and critics alike, he sketched Darwin as a bishop in a letter of 1868, giving audience to a humble believer, in the form of a German naturalist. Like Gray, Huxley wrote a series of reviews of Origin . But he presented a completely different picture: one in which Darwin’s critics were branded as biblical literalists or arch-conservatives. In many of the accounts of the encounter at the British Association meeting, observers gave the victory to Wilberforce; one Darwinian was reconverted to special creation after hearing the bishop’s speech. Wilberforce’s own review of Origin suggests that he was not in fact opposed to transmutation, only to Darwin’s particular explanation for it. The political aspect of the evolution debates is of course even more pronounced today, and it is crucial to understanding how Darwin continues to be a watchword. Today we have to contend not only with pervasive misrepresentation and misquoting, but also with the strong tendency to oversimplify the issues at stake, as if we had only two choices: science or religion; evolution or belief in God. Darwin’s correspondence shows that this certainly was not the case, not for Darwin, and not for his readers. The letters give a richer picture of Darwin, and of the debates in which his work was embroiled. Charles Robert Darwin, naturalist, On the Origin of Species (1860). Francis Henry Egerton, earl of Bridgewater; Bridgewater treatises. Treatise I, by Thomas Chalmers. The adaptation of external nature to the moral and intellectual constitution of man. 2 vols. Treatise II, by John Kidd, On the adaptation of external nature to the physical condition of man. Treatise III, by William Whewell. On astronomy and general physics. Treatise IV, by Charles Bell. The hand: its mechanism and vital endowments as evincing design. Treatise V, by Peter Mark Roget. Animal and vegetable physiology considered with reference to natural theology. 2 vols. Treatise VI, by William Buckland. Geology and mineralogy considered with reference to natural theology. 2 vols. Treatise VII, by William Kirby. On the history, habits and instincts of animals. 2 vols. Treatise VIII, by William Prout. Chemistry, meteorology, and the function of digestion. Asa Gray, Harvard professor of botany. William Herschel, astronomer, 'Astronomical observations relating to the construction of the heavens' (1811). Thomas Huxley, zoologist, Man’s place in nature (1863). Charles Kingsley, Anglican clergyman, later professor of modern history, Cambridge. Charles Lyell, Principles of geology (1830-33). Hugh Miller, Footprints of the creator (1849). 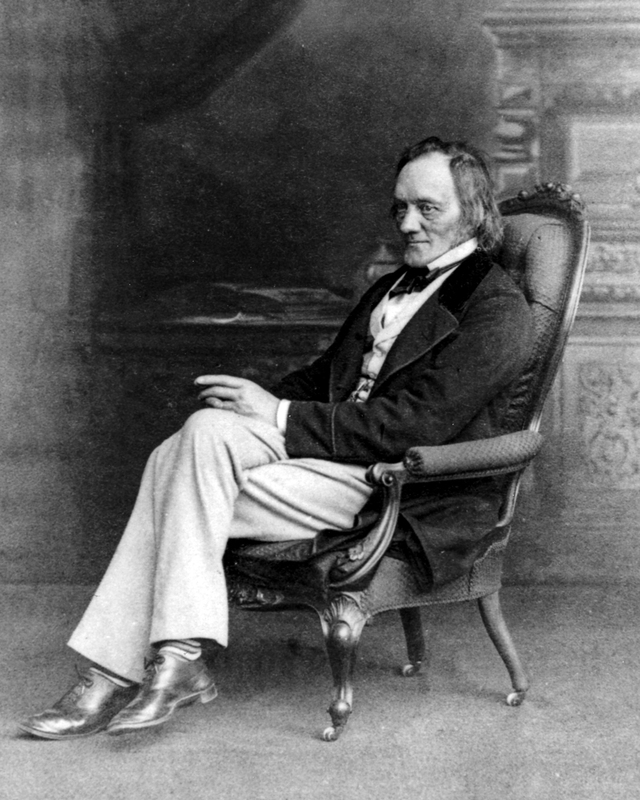 Richard Owen, On the archetype and homologies of the vertebrate skeleton (1848). Samuel Wilberforce, bishop of Oxford. Scholar and patron of learning. His literary works, many on his notable ancestors, were mostly privately published. Bequeathed £8000 in his will to commission works illustrating the "power, wisdom, and goodness of God as manifested in the Creation"; the money to be divided among eight persons. The resulting essays have become known as the Bridgewater treatises. FRS 1781. American botanist. Fisher Professor of natural history, Harvard University, 1842–73. Wrote numerous botanical textbooks and works on North American flora. President of the American Academy of Arts and Sciences, 1863–73; of the American Association for the Advancement of Science, 1872. Regent of the Smithsonian Institution, 1874–88. Foreign member, Royal Society of London, 1873. Zoologist. Assistant-surgeon on HMS Rattlesnake, 1846–50, during which time he investigated Hydrozoa and other marine invertebrates. Lecturer in natural history, Royal School of Mines, 1854; professor, 1857. Appointed naturalist to the Geological Survey of Great Britain, 1854. Hunterian Professor, Royal College of Surgeons of England, 1862–9. Fullerian Professor of physiology, Royal Institution of Great Britain, 1855–8, 1866–9. President of the Royal Society of London, 1883–5. FRS 1851. Author and clergyman. Appointed professor of English, Queen’s College for Women, London, 1848. Regius professor of modern history, Cambridge University, 1860–9. Rector of Eversley, Hampshire, 1844–75. Chaplain to the queen, 1859–75. Scottish quarryman, poet, ecclesiastical journalist, and geologist. Examined the stratigraphy of parts of Great Britain, in particular the Edinburgh district and the Hebrides. Author of popular works on geology. Clergyman and philosopher. Propounded a popular system of natural theology. Clergyman. Rector of Brighstone, Isle of Wight, 1830–40; of Alverstoke, Hampshire, 1840–3. Chaplain to Prince Albert, 1841. Dean of Westminster, 1845. Bishop of Oxford, 1845–69. Bishop of Winchester, 1869–73. FRS 1845.